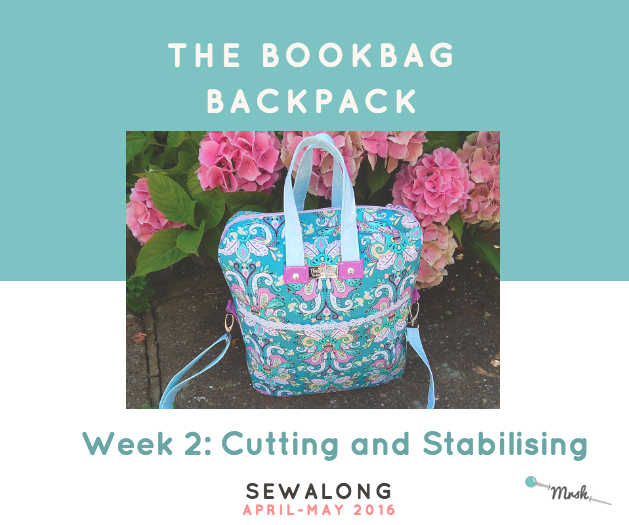 Today we are going to start cutting our fabric and stabilising the bag! Feel free to put the kettle on while you read this post and we’ll promise we won’t tell if you decide to have a tasty snack with your cuppa. Don’t forget that a seam allowance of 3/8” (1cm) is included in the pattern, unless otherwise stated. The A and B pattern pieces are included on the pages at the end of the directions. Please cut the remaining pieces to the measurements provided. You can make your backpack smaller or larger by printing the A and B pieces at your desired scale. When you do so, make sure you scale down or up the rest of your pattern pieces, so that everything fits together like a charm. Our recommendation is to first sew the Bookbag Backpack in its original size, which makes a backpack measuring approximately 12” x 15” x 4” (30.5 cm x 38 cm x 10 cm). To reduce bulky seams, you may wish to cut your heavy stabiliser a 1⁄4” (6mm) smaller that the pattern. If you’re going to use non fusible stabilisers such as Soft & Stable or Headliner fabric and wish to quilt your bag, please remember to quilt it to your outer fabric before cutting the pattern pieces, as quilting can cause shrinkage. Since you are going to cut quite a few pattern pieces (I promise it will be worth it in the end ), you may wish to label each piece or set of pieces with a bit of masking tape or post-its to remember which is which. This pattern has 8 pieces that you are going to cut various times, following the diagrams below. To make work a bit easier, we are going to be cutting pattern pieces in three sessions: we’ll cut the main body pattern pieces first, then the straps and finally, the inner pockets. 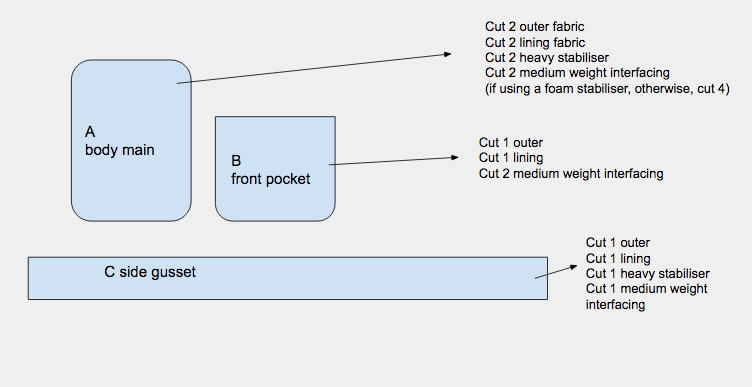 Print your pdf pattern, cut out your pattern pieces and start cutting. At the end of this section you should have cut piece A 8 times and piece B 4 times. Piece C will be cut 4 times as well. Next cut pieces from D to K, according to the instructions in your fabric. Take your time and double-check before you cut. Fuse the interfacing to pieces following your pattern, then attach your fusible fleece or apply foam stabiliser. If the stabiliser you're using is not fusible, you can quilt it or baste it on your fabric. As you do this, mark the centres of the zip gusset, side gusset, and main panels in the seam allowances for both lining and outers. You will find this extremely helpful later, when you will have to sew the pieces together.